As our year’s coldest weather may be on its way this weekend, it might warm you to compare this spell to one lesser-known historical cold temperature record. New York City metro area winters are a quite a bit warmer than they were in the 1800s, thanks to the urban heat island and long-term global warming. In today’s climate, we rarely have temperatures below 10 degrees F — it occurred one time last year (see map below), and zero so far this year. But this used to occur much more frequently — the record number of days in one year that fell below 10 degrees was 19 days, in 1875. As shown below for the coldest night of 2011, urbanized areas of the region are 5-10 degrees F warmer than surrounding greener areas. The same is often the case on clear nights at any time of year, including summertime heat waves when the extra heat can be deadly. 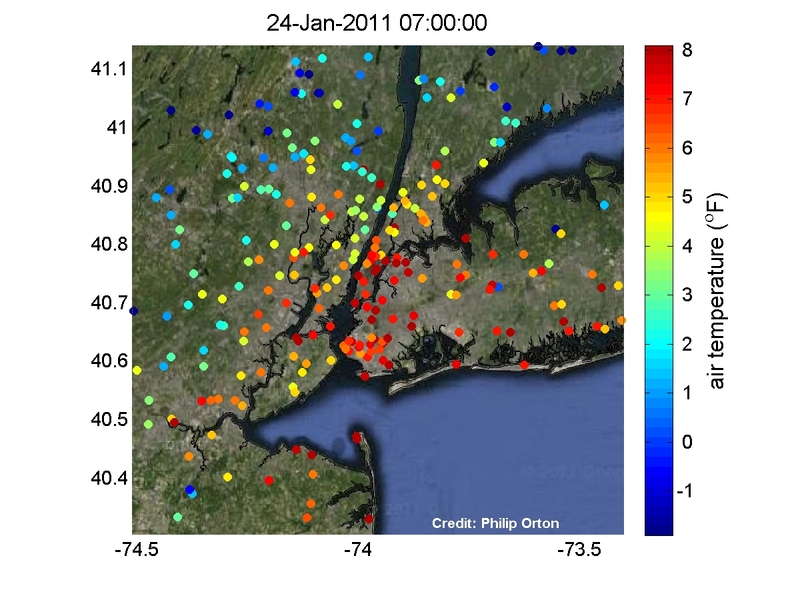 Map of air temperature during the coldest hour of 2011 in New York City, January 24th, at 7:00am. Data comes from a wide range of public and private weather stations, and is from a wide range of heights, so one should not focus too much on any one station, particularly those that differ from neighboring stations. Data credits are given at the bottom of this post. The background image above is Google satellite view, and shows how the urbanized areas (grey) are warmer than the rural areas (green). The ocean and inland waterways like the Hudson also likely play a large role in keeping parts of NYC warm in wintertime. However, winds were calm, so the warming effect of the nearby ocean likely was not strong around most parts of New York City. The heat island at the center of the city was already nearly as strong as it is today in 1900, due to the very large central urban population that already existed (think tenements). As far as global warming’s role in the warming of the city over the past 150 years, it is likely similar or perhaps a bit less — the region’s wintertime temperature has warmed by about 2-3 degrees in the past 120 years, though nights have probably warmed more than that. But since the growth of the heat island has slowed, and global warming has accelerated, the latter may be more important from here onward. Urbanization changes land surfaces, modifying their reflectivity (albedo) so that they absorb sunlight differently, and modifying their emissivity so they release heat differently than non-urban lands. Also, the irregular topography of buildings reduces the average wind speed, reducing the removal of relatively warm air from street valleys. Also, human sources of heat such as apartment heating, automobiles and power plants all make a large contribution, especially during wintertime — for example, one study found a greater input of heat to the city center of Toyko one night in wintertime (~1500 Watts per meter squared) than is provided by sunlight on a sunny day (see the PDF). Some of this is due to inefficiency — many people in NYC apartment buildings gripe about antiquated heating systems where one must crack windows to release excessive heat in winter. This entry was posted in climate, weather and tagged climate change, cold, freeze, global warming, heat island, long island, new jersey, New York City, night, record, urban, winter. Bookmark the permalink. Great analysis Phil, as always. Fascinating weather history here.